​ I have been a client here for more than 5 years (still am) and I have absolutely no regrets. It was one of the best decisions I have ever made. Before trying this place my face was suffering from really bad acne. At one point it got so bad that I decided my face needed help. Today, my face has improved so much that I have the confidence to go out in public without make-up on. This is all thanks to the excellent, first class, and professional service at Lege Artis. Their products are also the best I have ever used. I recommend their B3B5 Intense Deep Cleansing Mousse. This is by far the best face wash ever made (personally made by Irina Revo). I saw results after using this product within 2 days. It helped to reduce the redness and irritation on my cheeks. 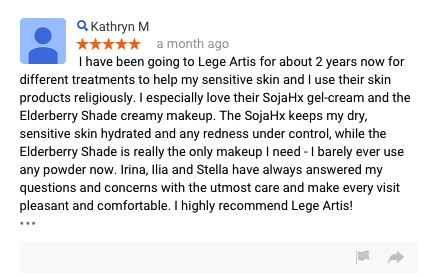 I would personally recommend Lege Artis to anyone experiencing skin problems. ​7/26/2013 I've been a client of Lege Artis for approximately 4 years. I'm fanatic about my skin and in keeping my skin clear which Lege has been instrumental in helping me to do. The team there is AMAZING! They really take the time to help you and genuinely care about you and how you feel and look. I now receive lots of compliments from people on my complexion and they are shocked when I tell them how I suffered from cystic acne. They are precise in their treatments and highly skilled. I've never write reviews, but I felt compelled to provide my testimonial on how wonderful, professional and amazing this place is. I highly recommend that you come to Lege Artis if you want beautiful skin!!! ​I can't express how grateful I am for how far you've brought me. Thank you for all of the support, confidence and help you've given me the past two years. I can't express how grateful I am for how far you've brought me. I wish you continued success and joy. I have been a client of Lege Artis for 8 years. 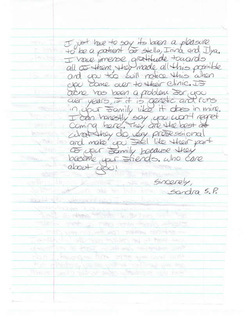 The care and attention, the level of quality provided keeps me coming back as a regular client. Whatever my aesthetic needs are - I am always in good hands. Currently I am undergoing the LightSheer laser hair removal procedure and the results are fantastic! Once again, the quality of the product and the professional care provided gives me confidence that I have made the right choice. ​My skin has never looked this good before! Lege Artis Skin Care Inc. really stay true to their name because they have very successfully given my dull skin a new life. My skin has never looked this good before! The G.M. Collin Puracne Oxygen Facial coupled with the Omnilux Light Therapy is ideal for people who need to revive their skin and bring out their skin's true beauty. After my first treatment, my skin has already started looking healthier, fresher, and smooth. I would highly recommend that people come in, even if it is just for a free consultation, because they have definitely changed the life of my skin as well as mine. ​From my first appointment they knew exactly what I needed. I have been suffering from acne since I was 17, over the years it had been under control. I had always used over-the-counter products and it seemed to work only at times not always. Years passed and when I was 21 it just started getting worse, I was skeptical of going to an Acne clinic and what dermatologist suggested were drugs I was never going to use. Therefore one day walking by Carlton Street I noticed Lege Artis skin clinic and saw their pictures of clients posted outside. The days passed and I kept seeing the sign until one day I wrote down the number and finally made an appointment. From my first appointment they knew exactly what I needed. They recommended me their acne line of face cleansers, toners, etc. I followed everything they told me and did all the procedures they recommended me. I can honestly say that they put themselves in your shoes, they go home and think about each of their clients about what can be done better to achieve better results. On my part I just had to be patient and over the months I saw noticeable results. in fact, all my family saw how my acne had improved. I even got my brother to try all my products and he eventually came to the clinic as well.dit. After having problem skin for so many years, I no longer have to worry! Thanks to you my skin was better then ever for my wedding day! I was able to take photos with confidence :-). After having problem skin for so many years, I no longer have to worry!! ​Over the past 16 years, Toronto-based Lege Artis Skin Care Inc. has built up a loyal clientele composed of customers who all want the same thing: beautiful skin. Art, medical science and cutting-edge technology come together at Lege Artis Skin Care Inc., a Downtown Toronto clinic that has been providing state-of-the-art skin care since it first opened in 1996. Led by Irina Revo, a European dermatologist with a light touch, a discerning eye and an engaging bedside manner, Lege Artis attends to a diverse clientele with varying skincare needs - from problem acne and rosacea to sagging skin and excess facial and body hair. "We see clients from different age groups," says Revo. "And we see both men and women in our practice." To achieve the best results for its clients, Lege Artis is always on the lookout for proven skincare technology. It recently purchased a Vbeam machine - next-generation laser technology that has become the gold standard worldwide for treating facial redness, rosacea, facial and nose veins and post-acne scars. "We've been getting amazing results with this machine," says Revo. She also continues to rave about her Omnilux Light Therapy - medical-grade non-laser technology that effectively treats a wide range of skin conditions such as acne and sun damage. 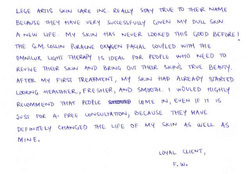 Patients looking to rejuvenate their skin also love the results they get with Omnilux, says Revo. To complement its technology and dermatological expertise, Lege Artis also carries select skincare products by G.M. Collin and Vivier Pharma. Revo is particularly excited about Vivier's SkinTx system, designed to correct hyper-pigmentation, aging skin, irregular skin texture and tone, and acne. "People get a youthful glow after using these products," says Revo. "Our clients love it and I'm really pleased with the results we've seen so far." Lege Artis is located at 27 Carlton Street, suite 201. For more information or to book an appointment, call 416 642 1382 or email info@lege-artis.ca. 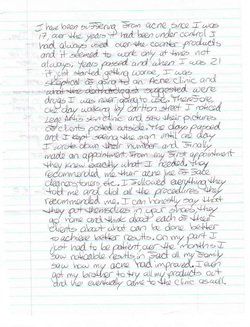 You can also visit the clinic's website at www.lege-artis.ca. Skin is always in at Lege Artis™ Skin Care Inc., even when temperatures begin to fall and people switch from summer wear to more covered-up fashions. That’s because the aestheticians at Lege Artis — a Latin phrase that translates to “state of the art” — are experts when in comes balancing technology and artistry to achieve great skin. “Our goal is to achieve the best results with the mildest methods available so there’s virtually no downtime,” says owner Irina Revo, who was educated in Russia as a medical doctor and dermatologist. 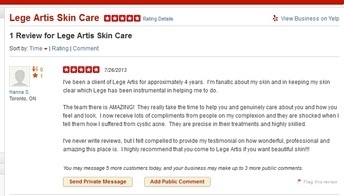 Lege Artis customers include people with acne and acne scars, aging skin, and unwanted hair. Depending on what each customer needs and wants, Lege Artis provides services that range from microdermabrasion and facial peels, to Intense Pulse Light therapy, laser and cold light therapy. The latter is delivered through a cutting-edge machine called Omnilux, which was originally developed in the United Kingdom to treat skin cancers but also proved to ! be effective in treating a host of other skin conditions. Because it enhances skin tissue repair and regeneration, Omnilux is especially popular with customers who have sensitive skin, says Revo. To learn more about Lege Artis, call 416-642-1382. Or visit www.lege-artis.ca. I just have to say its been a pleasure to be a patient of Stella, Irina and Ilya. I have immense gratitude towards all of them, they made all this possible and you too will notice this when you come over to their clinic. If acne has been a problem for you after years, if it is genetic and runs in your family like it does in mine, I can honestly say you won't regret coming here. They do the best at what they do, very professional and make you feel like their part of your family because they become your friends, who care about you.